Released: 27th August 2015 (UK) / 6th October 2015 (US). Official synopsis: "Award-winning writer Patrick Ness's bold and irreverent novel powerfully asks what if you weren't the Chosen One? The one who's supposed to fight the zombies, or the soul-eating ghosts, or whatever this new thing is, with the blue lights and the death? What if you were like Mikey? Who just wants to graduate and go to prom and maybe finally work up the courage to ask Henna out before someone goes and blows up the high school. Again. Because sometimes there are problems bigger than this week's end of the world and sometimes you just have to find the extraordinary in your ordinary life. Even if your best friend might just be the God of mountain lions... "
I am going to start this review with a confirmation. A confirmation that things are about to get real gushy around here, because my love for this book... UGH! I cannot contain it and I cannot even begin to explain it! Just... This book!!! Ugh! Life affirming! Just bear with me, we'll get there, I promise! Longterm readers of my blog, or followers on my twitter, will probably know that I am a bit of a latecomer when it comes to Mr. Ness. I have only read his last few releases (from 2013's The Crane Wife onwards...) but what I have read I have loved and so I had high hopes for The Rest of Us Just Live Here. I mean the title alone had me hooked and demanding to read on, before I'd even read a single sentence of the book itself. And once I got into the real meat of the story I was not disappointed! I was surprised! I had formed an idea of what I thought the book would be just from the blurb and I was so wrong and I am so glad that I was because the book is way better than what I thought it would be! We are all too used to reading the story of the hero, the chosen one, the one slayer in every generation, the boy wizard who alone has to power to stand up to the darkness, the blah blah blah. Yes, these make for exciting, high octane stories. But what about the bystanders? Your general citizen who isn't the chosen one? Who doesn't have any extraordinary power to help them save the day. What about them? Their lives are just as important, aren't they? Their stories. Sometimes the most important thing in the world isn't that there is a zombie invasion about to break, or a group of vampires ready and waiting to decimate your entire town. Maybe the biggest problem in the world is that you want to go to prom and that you're scared to ask the girl you want to go with. And it doesn't help when your mum is a politician, running for some office you couldn't care less about, neglecting you and your siblings more and more with every passing day. Isn't it that simple to understand? The world is so much more than disaster waiting to happen. There are far harder things to face than the big bad itself. I really do not know what I can say that hasn't been said by countless others. 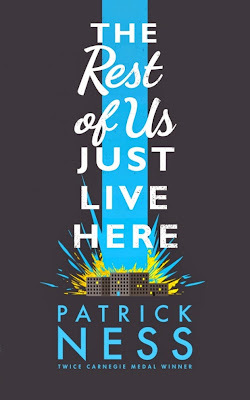 Patrick Ness is a total genius. His characters are so real and relatable. Especially Mikey. OH GOSH MIKEY! I cannot begin to explain just how much I related to Mikey. I don't think I have ever in my life connected and related to a character like I did Mikey. His thought processes, and the horrible, gut-wrenching feeling that I know all too well. That you're the least wanted person around! I think it's such a fundamental human feeling to have. We all get it at times, I know, but some more than others. I've had my fair share of crap over the years and one thing I've always dealt with is feeling like an outsider. At school. At work. At home. Even in my own mind sometimes. So the moment I read that section of the book, and got deeper into Mikey's mind, I'm not going to lie there might of been a few tears. Just a few, but tears nonetheless. The portrayal of mental illness, in the form of OCD in this book, was phenomenal. It felt real, at times shocking and most of all thought-provoking. I think it's all too easy these days for people to be so flippant about it. "Ooh, I've got a touch of OCD... My desk has to be immaculate, I hoover my floors every day." But for some people it isn't flippant. It's real, it's dark and it's scary and the way this book opens your eyes to it is amazing, and for that alone Patrick should be proud of himself for writing such an incredible piece of work. I also feel it is so easy for people to be dismissive to people with mental illness. Some people brush it off, don't believe in it so to speak, claim that it is put on. But the message in this book that it isn't your fault, that you do need help and can get it is a wonderful, beautiful thing. BRAVO! The subplot running through the book at the start of every chapter was also an awesome addition, and one that I think works very well. The characters we are dealing with have no idea that the end of the world might happen tomorrow. They are just going about their everyday life, but the indie kids fighting the end of the world know all too well what is going on. Some of the chapter openers had me howling, they had me concerned for the safety of Mikey and his friends, and they kept me wanting to read on because it showed a great contrast between the two sides. Mikey and his ordinary life, just trying to get on, and the lives of the superheroes trying to save the town and the world. 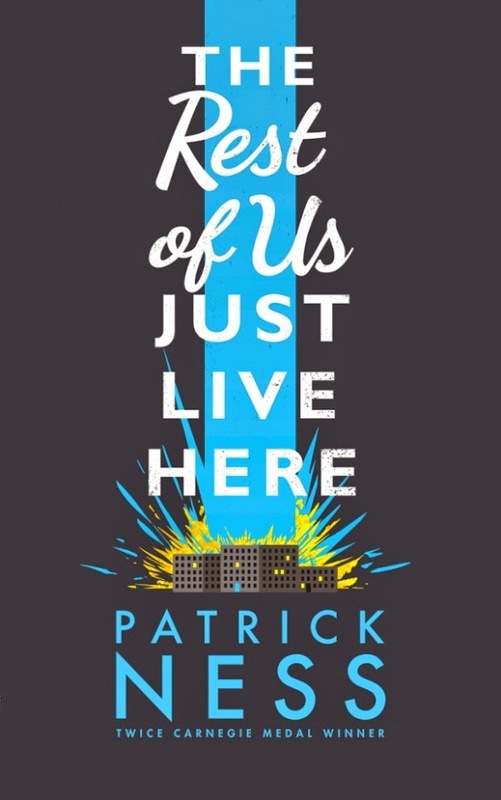 Overall, The Rest of Us Just Live Here is a fantastic, life affirming and important read. As is becoming expected from Patrick, it is beautifully written. Funny. Emotional. Highly addictive - you just cannot stop at one chapter before bed! It's impossible! I cannot recommend this book enough - whatever you are doing just get it and read it. It really is a marvel! Thank you for such a wonderful book, Mr. Ness, and thank you to Walker for allowing me to read it so early ahead of publication. I am so honoured!